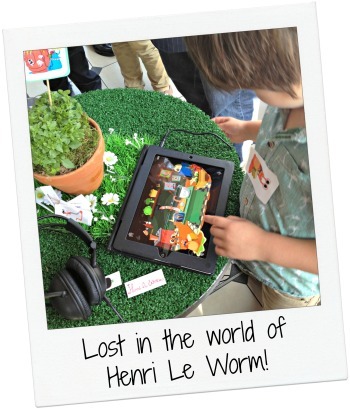 A couple of weeks ago, the kids and I were invited along to the launch of a brand new interactive cooking app for kids, Henri Le Worm. I was beyond excited when I heard that part of the event was a cookery masterclass with Raymond Blanc! The app is aimed at kids aged 2 and up. Although Daniel fits into that age range at 2 ½, he much prefers running and climbing to cooking nicely with famous French chefs. At 4 ½ Joshua is a super keen cook who refers to himself as 'Joshua chef' often dreams about food. With Daniel safely at Granny's house, Joshua and I took the train to London together for a very special mummy and Joshua day. 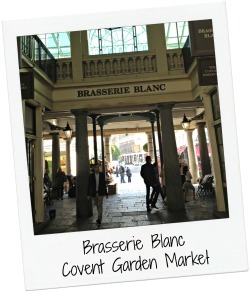 The event was held at the beautiful Brasserie Blanc in Covent Garden Market. It started at 9.30am so we were there early enough to see the market stalls being set up for the day. At the door we were greeted by two hilarious guys with stripy tops, berets and fake French accents. They kept the kids thoroughly entertained by making balloon animals and generally being very silly. They were fantastic and the kids loved them. Inside, Brasserie Blanc was decorated Henri Le Worm style. It was like a cute little garden with pot plants and fake grass. Cut outs of the colourful Henri Le Worm characters dangled from the ceiling. The kids (and the grown ups) had the opportunity to sit at small round tables covered with plastic grass and try out the Henri Le Worm app. Joshua really enjoyed playing the games on the app. As well as games, the Henri Le Worm app also has lots of child-friendly recipes which are written by Raymond Blanc. His son Oliver Blanc is one of the developers of the app along with Charlotte Salt. British actor Simon Pegg does the voices of the little charters which include the very French Henri Le Worm and his sidekick Derek the Ladybird. The highlight of the event was the cooking masterclass with Raymond Blanc. If he ever feels like giving up being a world famous chef he should teach children to cook as he is absolutely brilliant with kids! He was so funny and animated when he spoke and he came round to encourage and help each of the children. He really is a lovely guy. We made two recipes with Raymond, the first was a very easy and very delicious chocolate mousse. Joshua, despite calling himself 'Joshua chef', decided categorically he would not wear his lovely Henri Le Worm apron. However, he was very keen on decorating the chocolate mousse, I think because it was an opportunity to eat the chocolate ball decorations. 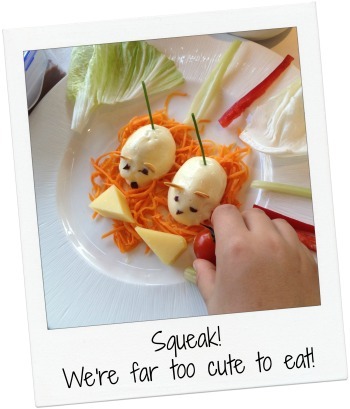 The second recipe was 'Mayonnaise Mice' which consisted of a hard boiled egg cut in half, smothered with homemade mayo and decorated with flaked almonds, olives and chives to look like a mouse. Served on a 'nest' of crunchy vegetables, the dish proved to be creative, nutritious and surprisingly easy to make! Raymond had also brought his lovely chefs along with him from his restaurant who were also great with the kids. At just £2.99 I think the Henri Le Worm app is fantastic value for money. It's entertaining and educational as it teaches kids about food as well as having games and recipes. Currently it's only available to download onto the iPad and iPad mini but in a couple of weeks it will be available on the iPhone and iPod touch. Not sure about android devices, best check the website or tweet them about that.